Based on the tried and trusted 3M Scott Safety ELSA emergency life support apparatus, the 3M Scott Safety ELSA Sprint positive pressure escape breathing apparatus offers simplicity and robustness combined with performance to European Standard EN402. The ELSA Sprint range offers durations of 10 and 15 minutes and is available in either facemask or positive pressure hood options. Lightweight PanaSeal positive pressure facemask approved to EN136 Class 3. Moulded in non-dermatitic Neoprene or silicone and fitted with an optically clear, impact resistant polycarbonate visor. Anti-scratch coating, speech diaphragm and side mounted, quickfit demand valve connection are standard. Supplied with head harness. The high visibility cuboid hood incorporates an optically clear visor to ensure all round vision. An elastometric neck seal ensures easy donning over spectacles, long or facial hair. A small orinasal mask controls the rebreathed CO2. Compact, automatic positive pressure, first breath activated demand valve. Unique servo-assisted mechanism provides superior dynamic and flow performance characteristics. Quick-fit coupling to mask or hood connection with secondary locking catch. Manufactured in light alloy and finished with an orange anodised protective coating. The low profile pressure indicator is fitted with a burst disc assembly to protect the valve. An EN144 outlet is fitted with rust tube and manual or automatic valve opening mechanism. 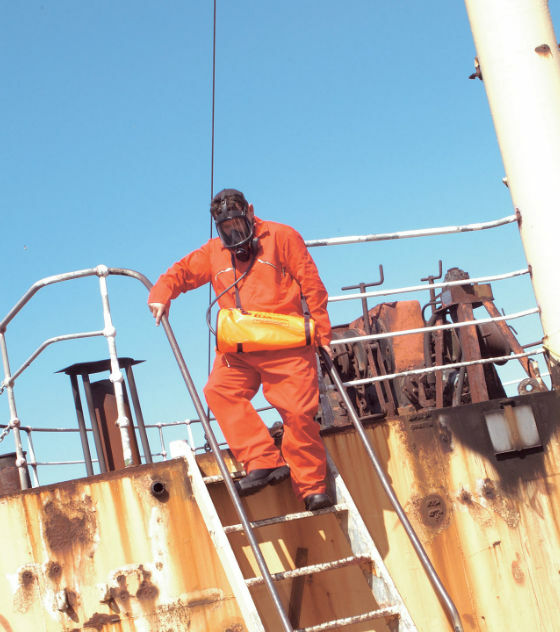 Worn in chest or bandolier mode, the high visibility carrying bag is available in flame retardant/chemical splash resistant material or the optional black anti-static material for use in potentially explosive atmospheres. 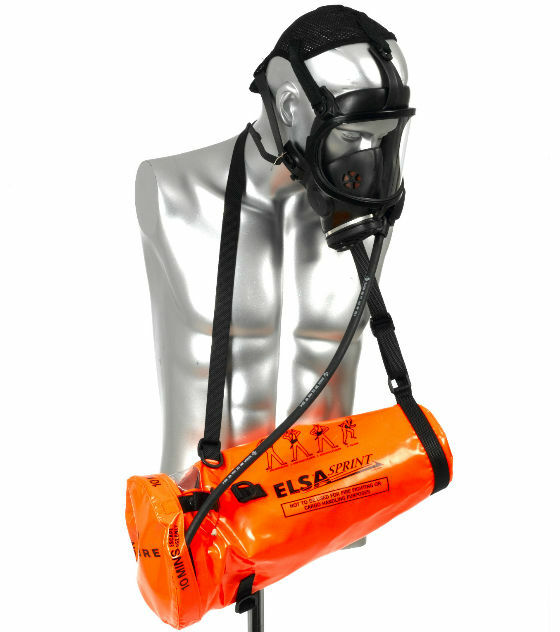 SPRINT-10-B ELSA Sprint positive pressure escape breathing apparatus complete with bag mounted 2.0 litre, 200 bar steel cylinder to CE specification providing 400 litres breathing air giving a rated duration of 10 minutes*. Pressure reducing valve and automatic positive pressure demand valve; Positive pressure facemask in black Neoprene with net headharness: carrying bag in high visibility PVC material. Apparatus weight 4.5kg. 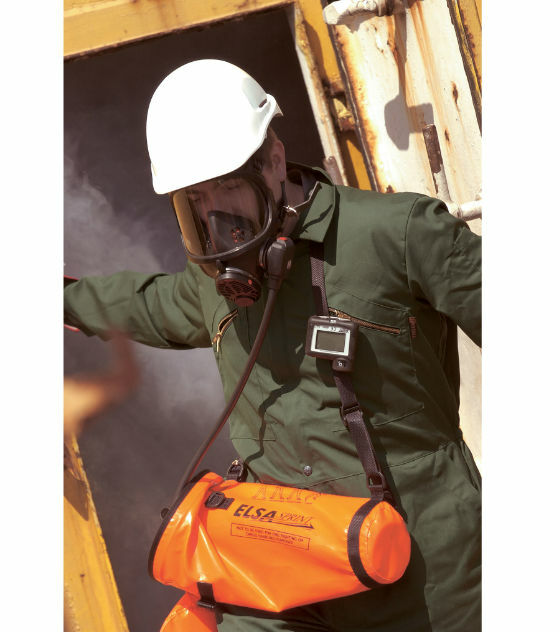 SPRINT-15-B ELSA Sprint positive pressure escape breathing apparatus complete with bag mounted 3.0 litre, 200 bar steel cylinder to CE specification providing 600 litres breathing air giving a rated duration of 15 minutes*. Pressure reducing valve and automatic positive pressure demand valve; Positive pressure facemask in black Neoprene with net headharness: carrying bag in high visibility PVC material. Apparatus weight 5.6kg. * Duration calculated using an average wearer consumption rate of 40 litres per minute. Add the following suffix to the above ordering details to obtain the following options. -HD High Visibility, flame retardent, positive pressure hood. 1045774 CYL-10-B-GB Spare cylinder and valve assembly, 10 minute version, 2.0 litre, 200 bar CE specification steel cylinder. 1045820 CYL-15-B-GB Spare cylinder and valve assembly, 15 minute version, 3.0 litre, 200 bar CE specification steel cylinder. 1035958 089.357.01 Testkit & Toolkit.